TOMORROW is the beginning of a brand new journey for many Bay Area Houston community organizations. And, as many conclude another year, they also are looking forward to next year with new officers guiding them and helping them reach even greater goals. Bay Area Museum Guild members got quite a treat for their year-end luncheon when outgoing President Carole Murphy hosted the event at her Brook Forest home in Clear Lake, where they gathered by her beautiful pool for refreshments before watching the installation of Kimberley Weathers as their new president. Others who’ll serve with her are First Vice Presidents – Programs Pat Biddle and Carole Murphy, Second Vice President – Membership Sandi Allbritton, Corresponding Secretary Jan Larson, Treasurer Diana Dornak, Recording Secretary Nina McGlashan and Parliametarian Cindy Kuenneke. Diana and Mary Ann Baxter will serve as museum directors with Ava Galt overseeing the gardens and landscaping and Peggy Clause handling publicity. Assistance League officers and elected chairmen for the coming year get together for a photo at their installation luncheon at Bay Oaks Country Club. 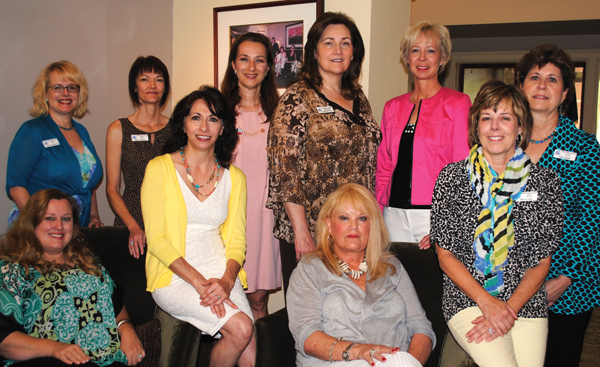 They are, from left, seated, President Kim Barker, President-elect Brunella Altemus, Vice President Courtney Atchley; Strategic Planning Chairman Dee Cover; standing, Marketing Chairman Jennifer Maxwell, Secretary Mary Gibson, Vice President Lisa Delhomme, Parliamentarian Elizabeth Clemente Nelson, Treasurer Elaine Rister and Vice President Gail Ashby. THE ASSISTANCE LEAGUE closed out its year with a big luncheon at Bay Oaks Country Club, where outgoing President Lisa Holbrook turned the gavel over to Kim Barker, who was installed as president, and Brunella Altemus became the president-elect. Other officers are Vice Presidents Gail Ashby, Lisa Delhomme, Courtney Atchley and Yvonne Perrin; Secretary Mary Gibson, Treasurer Elaine Rister and Parliamentarian Elizabeth Clemente Nelson. Joining them in serving the organization this coming year are four elected chairmen – Assisteen Coordinator Rikie Bowker, Education Chairman Kim Steele, Strategic Planning Chairman Dee Cover and Marketing Chairman Jennifer Maxwell. The league also honored Sharon Dillard with the Sue Holstein Award, Jenny Verghese with its Sue Brady Award and Sarah Foulds, Suzanne McMannie and Badiha Nassar with the ABCD (Above and Beyond the Call of Duty) Award. New Houston Symphony League Bay Area officers share a light moment as they line up for their installation at Bay Oaks Country Club. 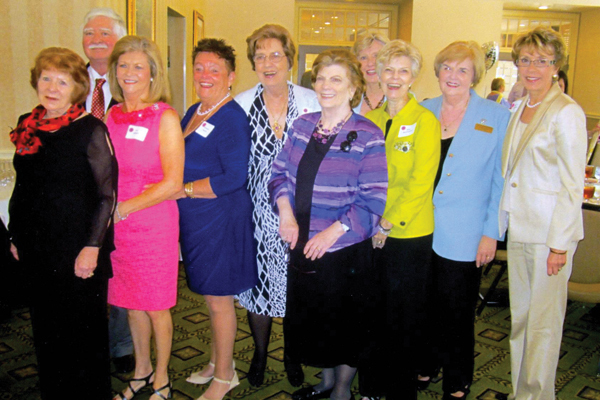 They are, from left, Vice President Joan Wade, President-elect James Moore, Vice President Pat Biddle, President Patience Myers, Corresponding Secretary Nina Spencer, Recording Secretary Frances Nussbaum, Vice Presidents Mary Voigt, Nina McGlashan and Carole Murphy and Fundraising Chairman Vicki Buxton. PATIENCE MYERS is the new president of the Houston Symphony League Bay Area. She was installed at their year-end luncheon at Bay Oaks Country Club, along with President-elect James Moore and the other officers. Serving with them will be Vice Presidents Pat Biddle, Joan Wade, Nina McGlashan, Carole Murphy and Mary Voigt, Recording Secretary Frances Nussbaum, Corresponding Secretary Nina Spencer, Fundraising Chairman Vicki Buxton and Parliamentarian Pat Bertelli. Already they are making plans for their prospective member party in August and their home tour in the spring. Sharon Dillard, right, is presented the Sue Holstein Award by last year’s winner, Dr. Cindy Castille, at the Assistance League Luncheon. CLEAR LAKE PANHELLENIC members have a new slate of officers for the coming year with Laurie Vaughn as their new president – taking over for outgoing President Wendy Shaw. Other new officers are First Vice President Kim Barker, Second Vice President Holly Williamson, Third Vice President Kay Lee Benoit, Treasurer Michelle Richardson, Secretary Marjo Richmond and Corporation Barbara Dickey, with Wendy serving as parliamentarian. THE ARTS ALLIANCE Center of Clear Lake has a new president – Myrna Baker, with Judith Blanchard as executive vice president, Mary Lou Johnson as secretary and Csilla Stiles as treasurer. Other board members are Susan Anne Braymer, Dr. Tina Farrell, Barbara Stubblefield, Rita Armstrong, Jim Sweeney, Jan Larson, Joyce Abbey, Jack Amuny, Heather Ann Amuny, Tim Dittman, Cheryl Evans, Dr. Marilyn Smith and Advisors Richard Williams, Pam Culpepper, Sue Garman and Dion McInnis. As it begins its 16th year, TAACL introduced new strategies to unite the arts, expand art education offerings and promote art activities – “Destination….Art” to promote the area as an arts destination and a spring juried art festival. Bay Oaks Women’s Association President Jennifer Simmons, right, welcomes Becky Hensley to the luncheon at the country club in Clear Lake. BAY OAKS Women’s Association members got to enjoy some of their favorite Broadway tunes at their May luncheon – ending the season on a happy note before the summer break. Carlene Langford arrived early to be on hand to welcome her guests – Cindy Woodall, Amy Langford and former BOWA president Becky Richey – joining Mary Colombo, Sue Broughton, Emmeline Dodd, Pam Ploss, Eileen Hult, Jeannette Koerschner, Danele Buehler and Diane Konick, who were among the early arrivals who signed in with Sharon Dillard. Wasn’t long before they were joined by Jackie Daley, Marilyn Lunney, Joan Wade, Kathleen Parrish, Elinor Walters, Barbara Dickey, Lorraine Gibson, Diane Konick, Rebecca Hensley, Barbara Miller, Sandy Lantz, Terri Divine, Lea Bodie, Tia Neyman, Nancy Sanders and Martha Meas. Some of the others President Jennifer Simmons welcomed included Annette Dwyer, Bobbie Moutz, Kathy Costanza, Shiva Landry, Nilse Deterling, Sue Ellen Jennings, Fran Gentry, Angela Bivens, Kimberley Weathers and her mom, Peggy Green, and Cambrey Rogers. Pasadena Dobie – Anna Ingalls, Claudia Gonzalez, Syeda Naqvi and Tiffany Mercado; Pasadena High – Eduardo Aleman Robledo and Gerardo Rivera; Pasadena Memorial – Ryan Summers; Pasadena Sam Rayburn – Ilse Molina; and South Houston – Carola Medina, Gabriela Dominguez, Jaime Buenrostro, Ramon Tamez and Yazmin Garza.